The same granite of which the pillar is made has never been found on earth and for almost 2,000 years the statue has not once needed dusting. 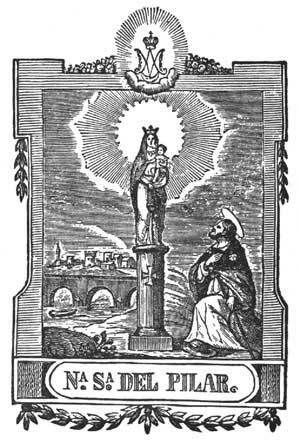 The sentiment of Zaragozans toward their beloved Virgen del Pilar — the Virgin of the Pillar — is quite different from the ordinary homage paid to a favorite saint or even to other Marian devotions elsewhere in the Catholic world. It is an inheritance from their forefathers, a love that is born with them and ends only with their deaths. It is interwoven with their patriotism, with their nationality, with their home life, and with their daily tasks and amusements, and it is an ever-recurring theme in their popular songs. The faithful of Zaragoza repair to her shrine in their joys and in their sorrows. They speak to her not in the ordinary forms of prayer, for she is not far away in Heaven, but here on earth among them, in her own shrine where she has dwelt for over nineteen hundred years. They converse with her as with a friend, and with the confident faith of children. “Viva la Virgen del Pilar” was the rallying cry that filled Zaragozan hearts with courage and strengthened their arms when, in 1809, they had to fend off the Napoleonic invasions of Spain. Then, frail women, faint with fatigue, disease and hunger, fired the guns and defended their homes, barricading doors and windows with the fallen bodies of their husbands, parents, and children. Then, the greatest kindness one could show the wounded, when all hope had fled, was to take them to the Capilla Santa — the Holy Chapel — where they could look upon the little brown face of “La Pilarica” — the Virgin of the little pillar — and speak with her, kiss the pavement of her house, and die breathing her name. In support of this conviction is the fact that since the city’s conversion to Christianity in Apostolic times, the sacred image has escaped injury, the rituals of the Catholic Faith have been celebrated unceasingly in the chapel where Saint James first officiated, and its altars have never been defiled by pagan rites despite all the centuries of war, rampage, and desecration by the Romans, Goths, Moors, or Vandals. Even time, the great destroyer, has failed to leave its marks on the statue: Although nearly twenty centuries old, it shows not the slightest sign of deterioration. Traditions of extreme antiquity attest to the Christianization of Spain by Saint James the Apostle. It is supported by such writers as Saint Hypolite, in his treatise “De duodecim apostolis,” by Saint Isidore, and by the Venerable Bede, and it is verified by the ancient Spanish liturgy, the Rite of Toledo, the so-called Visigothic or Mozarabic liturgy. 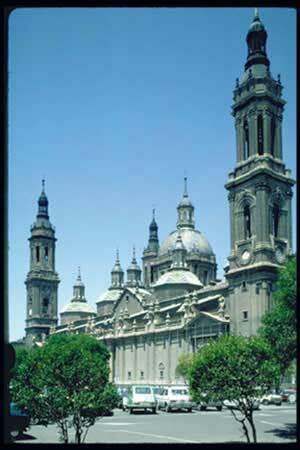 More recent and better known to American Catholics are the writings of Venerable Mary of Agreda, which contain a worthy account of his apostolate in the Iberian peninsula and, more specifically, about Our Lady’s miraculous visit to Saint James in Zaragoza during her lifetime. Most impressive are the countless pilgrimages to the tomb of the Saint by the entire Christian world since long centuries ago, whereby we know that it was generally held not only that Saint James spread the Gospel in Spain but that after his martyrdom in Jerusalem, his body was returned to Spain and buried next to his disciples in the little Galician town of Iria Flavia where he had dwelled and whence he used to set forth on his journeys to preach of Christ throughout the Peninsula. After having preached the Gospel of our Divine Lord and Master in Judea and Samaria, Saint James traveled to Spain to spread the Faith there. He disembarked at Carthagena and started to preach the Gospel of Jesus Christ. His simple eloquence won the hearts of the rude Iberians, who came flocking in large numbers to receive the Sacrament of Baptism from his hands. In Andalusia, Castile, Galicia, and Portugal he met with the same success, and so when he finally entered Zaragoza his fame had traveled before him, and the light of Faith spread quickly throughout the city. On the night of the second of January, forty years after the birth of our Savior, Saint James was walking along the banks of the river Ebro with seven disciples whom he had won to the Faith in Zaragoza. The sky was aglow with myriads of stars, the toils of the day were over, both man and beast had gone to rest. Inspired by the calm beauty of the night and the contemplation of the glories of the Heavenly dome, in whose wonders they saw the Master’s hand, they spoke reverently of the sublime mysteries of the Divinity. Having spoken these words, He disappeared, and a band of angels, singing canticles of joy, filled the room. Raising Mary on their wings, they bore her through the air. Saint James, near the banks of the Ebro, knelt in prayer with upturned face while his companions, fatigued with the labors of the day, had closed their heavy eyelids and, like the Apostles before them, slept while their master prayed. A flash of light suddenly lit up the fields, sounds of Heavenly music filled the air, and the seven disciples, roused from their slumbers, gazed with wonder and fear at the apparition before them. Seated on a throne of light, borne aloft by angels, was Mary, whom they supposed was in Jerusalem. She then commanded the angels to place the column with its sacred image where it stands to this day, and as the angelic cortège disappeared, Saint James and his disciples praised God and offered to Him the first shrine ever dedicated to His Blessed Mother. Soon after, Saint James and his disciples built a modest chapel, sixteen feet long by eight feet wide, to enclose the Virgin’s gift. This chapel succumbed to time and the elements and was replaced by several others, but the sacred column has always remained in the spot where the angels placed it. The piety of the faithful and the offerings of pilgrims, whose numbers increased steadily to multitudes, attracted to the shrine by the fame of the miracles attributed to the Virgin of the Pillar, eventually raised a church that remained until the end of the seventeenth century, when Charles II, the last monarch of the Austrian dynasty to occupy the Spanish throne, built the splendid edifice that now enshrines the column and statue. The first stone was laid on the feast of Saint James in 1686. In 1753, King Ferdinand VI engaged the celebrated architect Ventura Rodriguez to build the sumptuous chapel in which the statue is now preserved. Above the high altar is a carving of the Virgin extending her hand to the Apostle, and over an altar to the right of this is a picture of the seven disciples of Saint James. On the left is the altar where, under a rich canopy of silver, against a dark background thickly studded with diamonds, stands the miraculous pillar with the statue of the Blessed Virgin and the Infant Jesus. Scientists, attempting to match the granite of which the pillar is made, have been able to find similar, but not identical, granite and only in other parts of the world. The statue of the Virgin is made of a material not found on this earth. By a miraculous divine action, no dust ever settles on it, so for almost 2,000 years the statue has never needed dusting. A silver railing of exquisite workmanship runs the entire length of the three altars, and the walls of jasper and marble glitter with offerings of gold, silver, and precious stones which, flashing in the light of the numerous silver lamps, fairly dazzle the eyes of the spectator. But the Zaragozan sees only “La Pilarica” and the costly gifts that have been offered in faith, devotion, and love to adorn her holy chapel: gifts from kings, queens, princes, and noble knights who have prayed at this shrine throughout the centuries: gifts from pilgrims who have come on foot from afar to lay their offerings at her feet: gifts from saints who left their jewels here before retiring from this world for ever: gifts from humble peasants, from toilers of the deep, and from the poorest of God’s poor, who saved and fasted for years to be able to offer a token of their love to La Patrona — the Patroness. It was in this church that the old kings of Aragon knelt to take their oaths of fidelity to God and to the people. Isabel the Catholic, who helped Columbus with his journey to the Americas, went frequently to Zaragoza and gave priceless jewels to the treasury of the Virgin: the Emperor Charles V, heavy with the weight of crowns, visited Our Lady of the Pillar and laid his sceptre at her feet before retiring to the monastery at Juste; Philip II, Philip III, Philip IV, all left memorials at the shrine, and Don Juan of Austria had such a devotion for the Virgin of the Pillar that he wished his heart to be buried in the crypt of the holy chapel. The holy chapel is never unoccupied for a moment from daybreak until the doors are closed at night. The crowds come and go continually. Very few people pass the church without entering, if only to salute “La Patrona!” and depart. There are chaplains whose time is entirely given to the services in the holy chapel; four of these guard the vestments and jewels of the Virgin, which they change according to the rituals of the Church and the festivals of the year. No others are allowed to touch the statue or to have access to the mantles and ornaments that belong to her. Every morning, as the first streaks of dawn break through the sky and the last stars have faded, one of the chaplains sings the “Mass of the Infants,” so called because the choir is composed of eight small boys, Infantes, who are dedicated to the service of the holy chapel and serve the many Masses that are celebrated daily. These boys wear a special uniform during the liturgy and processions. This Mass is the first of the innumerable prayers that are murmured unceasingly from this moment until the echo of the last notes of the Salve Regina die away in the vast arches at nightfall. 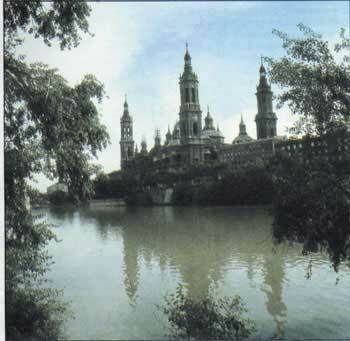 It is considered a great privilege among the Zaragozan families to have a son as an Infante of Our Lady of the Pillar. The Feast of the Virgin of the Pillar is celebrated with great pomp and ceremony on October 12 [Ed. : note the date’s connection to Our Lady of Fatima’s miracle of the Sun], beginning with the Mass of the Infants at four in the morning. The city puts on holiday attire for a week, all work is suspended, and visitors pour in from all parts of the Peninsula to make their devotions and take part in the celebrations at the famous shrine. On October 11, bands parade the streets and fireworks are set off at intervals. This is the formal announcement to the public that the festivals are about to commence. Trains arrive every half hour loaded with passengers, and cars by the thousands come from every corner of Aragon and the remotest parts of Spain. As early as two o’clock on the morning of the 12th, the crowds begin to enter the church, and when the beautiful voices of the Infantes sing the first notes of the Mass, the edifice is so packed that it is difficult to move. At the conclusion of the Masses the worshippers stream out at one end while others stream in at the other, and this continues throughout the entire day. It is virtually impossible to estimate how many come to pray on this occasion. When the sun has set and night begins to fall, the bells peal a joyous call to the Salve Regina, all the doors are thrown wide open, and the church soon fills to capacity, without apparently diminishing the immense throngs that have gathered in the Plaza del Pilar. All classes are there, peasants in picturesque costumes who proclaim their native places; children, some in fine clothes, others in tatters; women, some wearing the latest French hats and others with their heads enveloped in traditional mantillas or in old shawls; working people from the vicinity, and tourists with Baedeckers in hand. All sorts of faces mingle with throngs of soldiers, priests, and Infantes, all pressing as one moving mass to hear the solemn notes of the Salve, the last act of devotion of the Feast of Our Lady of the Pillar. Outsiders may look upon this tradition as absurd and impossible, but the Zaragozan sees nothing unusual in it; he dwells in an atmosphere of saintly love, and the inhabitants of Heaven do not seem so very far away from him, for he has evidences of their presence on all sides; he lives with them with a familiarity that might appear irreverent were it not for its genuine simplicity. 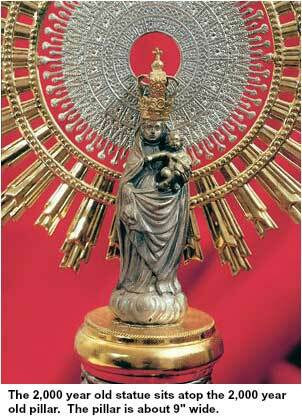 This “Stories of Mary – Stories of the Rosary” is taken from Crusade Magazine, September – October, 1998.